Today I welcome to the BRAND new you show Lisa Cummings founder of Pinch Yourself Careers. As the Chief Strengths Sleuth, Lisa brings 20 years of experience in helping people find and leverage their strengths at work. Her key takeaway from the book was how leveraging your strengths at work will make you stronger while using your weaknesses makes you weaker. Yet for some reason, the world seems obsessed with fixing what’s “broken” with people. Since that realization, Lisa has focused her career on developing people. Now as a certified Strengths performance Lisa focuses on the potential in people and how it can be unleashed by using their strengths. Summary from Amazon – Part memoir, part master class by one of the bestselling authors of all time, this superb volume is a revealing and practical view of the writer’s craft, comprising the basic tools of the trade every writer must have. King’s advice is grounded in his vivid memories from childhood through his emergence as a writer, from his struggling early career to his widely reported, near-fatal accident in 1999—and how the inextricable link between writing and living spurred his recovery. Summary from Amazon – Are You Fully Charged? reveals the three keys that matter most for our daily well-being, as well as our engagement in our work. Drawing on the latest and most practical research from business, psychology, and economics, this book focuses on changes we can make to create better days for ourselves and others. The StrengthsFinder assessment is a tool used to assess your natural talents. It consists of 177 questions but don’t let this number scare you away from taking it. The time goes by very fast because you are answering a series of “choose this over that” type of questions. You will be assessed on 34 strengths themes and upon completion, you will be presented with your top 5 talents themes. If you want to you can unlock all 34 strengths for an additional fee. The StrengthFinder themes essentially help you focus on what’s right for you. They include your natural thoughts, feelings, and actions that are already inside you. The idea is bringing those Strengths to the surface and making you aware of them will allow you to invest in your strengths in order to become a stronger performer. The StrengthsFinder assessment gives you tools and a language to help you when thinking about who you are as a person. Once you reach this point you can start to focus on what’s right with you. As a first step, Lisa recommends simply reading though the report and, in particular, the Insights section. Take the time to highlight the sentences or phrases that really resonate with you and think about each of those sentences show up for you everyday at work. Next have someone who is close to you, a family member or even a co-worker, go through the report with you to see if they highlight the same phrases you did. You’ll be surprised at how closely others will see you in comparison with the assessment. HOW DO YOU KNOW IF THE STRENGTHS FINDERS ASSESSMENT IS RIGHT FOR YOU? Lisa is asked this question often and her answer is that everyone can benefit from taking the test. The assessment helps us see ourselves from a different viewpoint that is not something we’ve been wired to see throughout our careers. If you think about it the typical management style is to tell us what we are weak or where they feel we need to improve. Very rarely will you find a manager who will tell you what you are good at doing. Lisa has noticed through her coaching what prompts people to take the test usually starts when they are feeling drained by the work they do, maybe they are struggling at work or in some cases even feel burnt out. 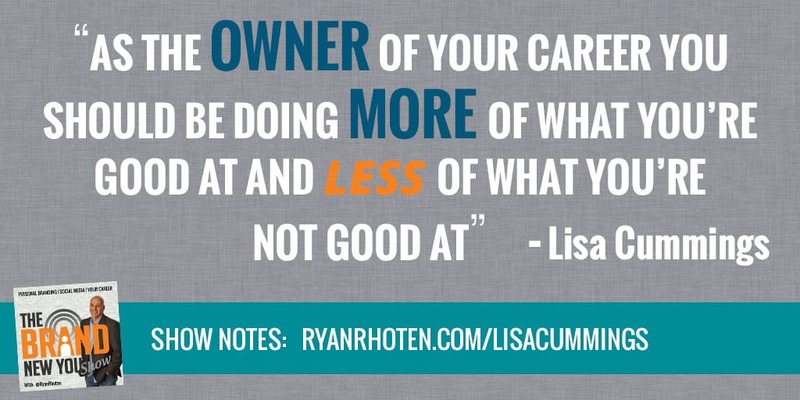 If this describes you Lisa encourages you to use the assessment to learn more about yourself and leverage this knowledge to shape your role into one that uses your strengths more and your “weaknesses” less. You can also use the assessment to determine if you need to move into a different role altogether. At Pinch Yourself Careers Lisa has integrated her StrengthsFinder performance coaching certification into a process she uses with her coaching clients. The process begins by taking the assessment. From there Lisa Cummings leads her clients through the heart of her process which she refers to as Name it, Claim it, and Aim it. Name It – Identifying with your top 5 strengths. Understanding what they are and how they show up for you at work. This part of the process can usually take up to a couple of weeks of paying attention at work and identifying when you are using a strength. Claim It – Once you can identify when you are using your strengths the next step is to fall in love with your strengths. This might sound a little weird but Lisa has found most people tend to resistance or deny their Strengths in the beginning. During Claim It, her clients make a commit to invest in themselves because they recognize in doing so it will make them a stronger performer. Aim It – Now that you can name and claim your strengths, Lisa works with her clients to taking their strengths and aim them at something specific such as a project, problem, or challenge at work. By the time they have worked through Lisa’s process, her clients begin to notice an improvement in their level of employee engagement and job satisfaction. This is not an uncommon result. Gallup has found when companies help employees work in their strengths they will typically see a 6X improvement in employee engagement and have even found a 3X improvement in the quality of life for the employee. To help spread the word, Lisa has a podcast called Lead Through Strengths. In each episode, she interviews experts, leaders and thought leaders on how using your strengths every day makes you stronger at work. The show offers a great mix of “showing” the listeners how their strengths can be used in many different applications and industries. I was honored to be a guest on Lias’s show where we discussed how your strengths tie to your personal brand. If you’re interested in hearing our conversation you can listen to that show here. The Best way to get in touch with Lisa is via the following methods. Lisa leaves us with these final thoughts about our careers.